Want to tie some colors together in your kitchen? Put those colors on a Tea Towel. (Remember what those are? In case you’re new, there’s a better explanation here.) 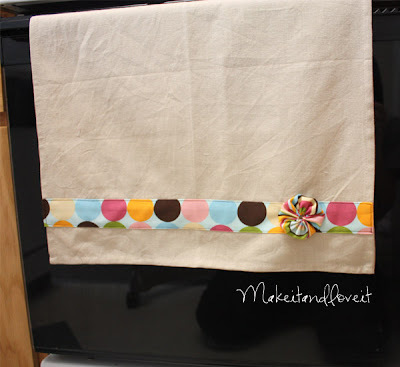 Add any sort of cotton fabric to the end of a tea towel for some instant beauty. My towel measured 18 x 28 inches. I decided that I wanted my strip to be 2 inches tall and to be as wide as the towel, 18 inches. I added 1/4 inch to all sides…….and cut out a strip of fabric that was 2.5 x 18.5 inches. Then, I tucked under each side a 1/4 inch and ironed it flat. Then, I pinned the strip about 2.5 inches from the bottom (just eye it and place it wherever you’d like) and sewed around the strip, very close to the folded edge. Okay, and then I just had to add a yo-yo from yesterday’s project. Hey, it might get in the way while drying those dishes……but who cares? It’s so darn cute on there. Enjoy it. Oh, and maybe gift it. It sure might make someone smile. I love the fabric that you used. Where did you get it? That particular fabric I bought at Hobby Lobby in Colorado during Christmas vacation. I wish we had one closer but…..no such luck. I am sure there are people that visit this blog, that have one nearby. Go…..it’s a fun store. So I love your site. Jodi is my aunt and I heard about your site from her’s. I love your fabric too. 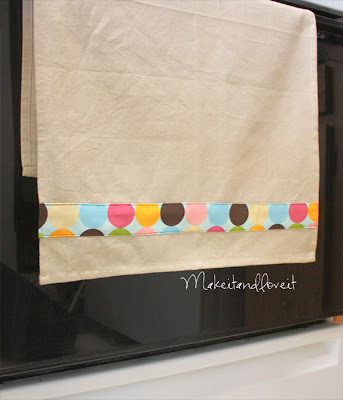 This is such a good project to use up fabric scraps!! I need more projects that do just that because I tend to be a bit of a pack rat with cute fabric no matter how small! I've used this idea on the towels, and then cut the towel to the length you want and make an apron out of it using matching ribbon to tie it. 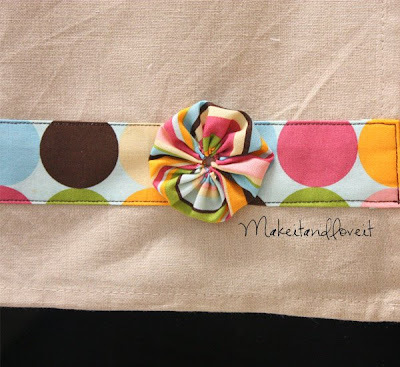 SEW easy, and EXTRA cute!! Where did you buy your towels? I can't seem to find solid colored tea towels around here. I want to make some for my sister's wedding in 2 weeks.